Granite is an ideal material for the surfaces in your home that face daily use, especially for work surfaces in your kitchen and elegant, high-luster bathrooms. Pick from our wide selection of granite slabs and remnants in a variety of shades to add an elegant touch to your bathroom or kitchen surfaces. Quartzite is often compared to granite in terms of hardness and durability. Quartzite is a popular countertop choice in today’s neutral-toned kitchen designs. It looks a lot like marble, which is highly sought-after for its luxurious quality. Quartz are top-rated materials that make great alternatives to granite for their durability, low maintenance, and anti-microbial properties. Quartz is a man-made material produced from stone chips, resins, and pigments, while quartzite is a metamorphic rock that originated from sandstone. The gaps in the sandstone were naturally filled with mineral quartz and over thousands of years the two were fused together, creating eye-catching white and gray swirls. Quartz is excellent choices for kitchen countertops and flooring. Get the high-quality look of stone – without its inconsistent patterns and veins –with engineered quartz kitchen countertops. Highly sought-after for its durability and beauty, marble delivers a clean, classic look. Marble tiles and slabs are available in multiple colors and various color combinations. Marble is unique, and like a human fingerprint, no two marble tiles and slabs are exactly the same. Light penetrates highly polished marble, creating an ethereal glow. Onyx comes in a variety of colors, and produces some of the most interesting patterns and textures available in a natural stone. One unique feature of onyx is its transparency. The stone slabs transmit light extremely well throughout the stone when back lit, giving onyx surfaces a naturally glowing, luminescent look. Stone retains heat better than almost any other material and is very resistant to wear and tear. Every piece of stone is unique with special veining, coloring, and natural characteristics that create a timeless impression. Natural stone has a hygienic surface that repels dust and pet hair. It’s also easy to clean, making stone the perfect material for your flooring on kitchens, bathrooms, hallways, living areas, or even on your accent walls, fireplaces, outdoor kitchens and exterior of your home. From rustic to contemporary, there are a variety of natural stone veneers available that will transform your home into a work of art. Porcelain tile and ceramic tile are both made from a mixture of clay and other natural material. During the manufacturing process, porcelain tiles are heated to a higher temperature, making them extremely dense and a harder material. This durability makes porcelain tiles less likely to crack in cold weather and hold up better against stains. Heavy-traffic areas, like bathroom and kitchen floors, are great places for porcelain tiles and they’re also an outstanding choice for your fireplace. Add ceramic tiles to your interior spaces, especially wall applications in bathrooms (vanity, countertops, floors, shower, walls), and the kitchen (countertops, floors, backsplashes). Metal tiles can be used to add a unique design element to any vertical surface. From contemporary to rustic, there are metal tile designs to fit any home decor. Metal tiles are often made from porcelain and metal composite materials and coated with a metallic finish, making them durable enough to be used in outdoor patios, bathrooms, and kitchens. They are also strong enough to withstand impacts and scratches. The reflective qualities of metal wall tiles creates the impression of space and because they mirror the hues of their surroundings, these tiles magically fit into any color scheme (even if you change it up in the future). Dare to be bold with our large selection of specialty tile. Specialty tiles are perfect for making the bathroom a unique and inspiring space within your home. With specialty tiles, you can transform your bathroom into a relaxing oasis, a favorite vacation destination, or any place that arouses your imagination. It is the perfect opportunity to be a bit unusual. Bring some adventure into your home with any of our specialty tiles for your next bathroom remodel or installation. From mosaic and decorative tiles, to metal and faux tiles, we have specialty tiles to make any space feel more like home. Visit our showroom in Redding to explore all of our specialty tiles. Let your light shine throughout your home and garden with glass and recycled glass tiles and slabs. Glass and recycled glass reflect light, making them appear slightly transparent, as well as making the room appear larger. 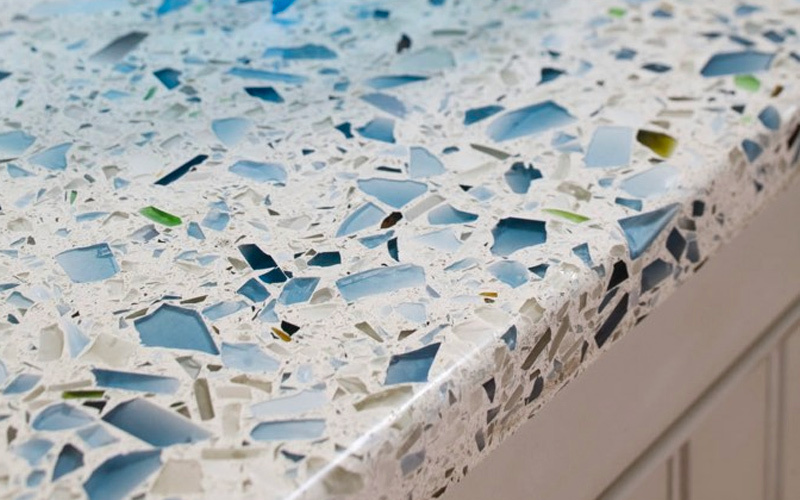 For a more artisan-inspired, hand-crafted look, choose tiles and slabs made from recycled glass. Glass and recycled glass repel water and stains, are mold and mildew resistant, and easy to clean. They are available in a wide variety of color options, making them an ideal material for your bathroom or kitchen remodel. We offer glass tiles and recycled glass slabs in a multitude of types, shapes and sizes, so you can get creative in any space of your home. Limestone is a popular choice for custom home features because it is durable, beautiful, easy to maintain, and is an eco-friendly option. With its muted tones and various styles, it can create a clean, comfortable and elegant touch to any room. Limestone is a natural stone made from sedimentary rocks under the bottom of the sea. These rocks are pressurized, making it long-lasting and porous. With the right seal, limestone tiles create a tough flooring for your high-traffic areas. Limestone resists mold and bacteria making it a perfect tile to use in bathrooms, around your pool, or for your outdoor patio. Slate tiles make a rugged and resilient flooring material. They are also extremely water and fire resistant when sealant is applied. Need a tough, family-friendly flooring tile that’s not easily damaged? Look no further. Slate tiles are not only the perfect material for flooring, they are an excellent option for your backsplashes, stepping stones in the garden, patio area, or around your outdoor BBQ. Slate tiles are great for retaining and transmitting heat, making them the ideal resource when considering adding radiant below surface coil heating systems during your remodel or new construction. Travertine is a type of limestone, and when used for flooring can add a unique blend of mountain-born beauty to any interior space. Travertine is never a uniform, solid color because of the bands of contrasting color that run throughout the stone. Travertine has a natural aged and weathered appearance. Its warm earthy tones can include soft ivories, creams, vibrant shades of golden yellows, silvery greens, reds, and deep mocha browns. Add travertine tiles for both floor and wall tile applications; countertops, outdoor patios, fireplaces, building exteriors and outdoor pathways. Mosaic patterns feature different materials, colors, and tile shapes. Popular materials include glass, stone, metal, and porcelain. In Ancient Greece and Rome, beautiful Mosaic pieces garnished temples and palaces. Now these fun, decorative tiles will turn your home into a castle. Glass and metal mosaics are especially luminescent and can brighten any room. 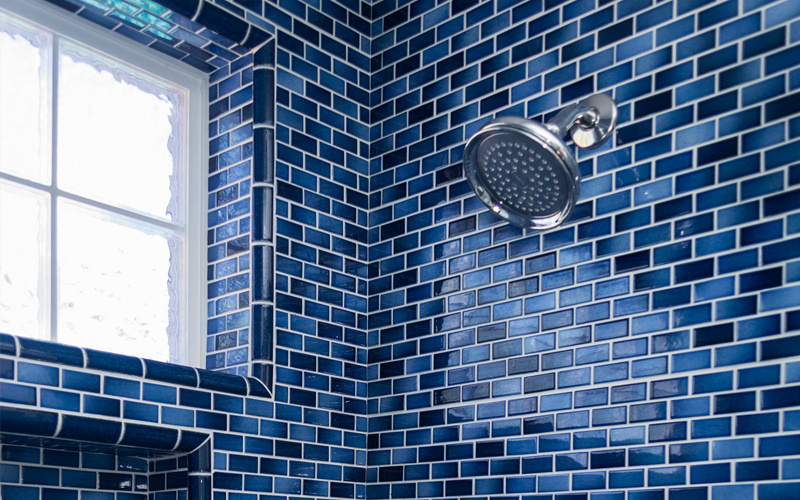 Glass mosaics are non-porous, making them resistant to stains, mold and mildew, and are easy to clean. There are many indoor and outdoor uses for mosaic tiles. Use polished mosaic tiles to embellish walls or create decorative focal points. Choose rough-surfaced tiles for flooring in the kitchen or bathroom. We carry many Green products in our tile and quartz lines including Geos, Silestone Eco, Caesarstone, and Original Style. Using recycled water and recycled materials reduces landfill waste and the consumption of our natural resources. It also reduces energy consumption, thus making Green products a friendlier product to our environment.